Here’s Facebook video link to an interview with Simon Macdonald (SIMAFOL on Flickr) done by Joe Meno back at spring’s Megacon. It’s about 14 minutes long with lots of detail on how he created the costume. This is his second costume (first one being LEGO Darth Vader). 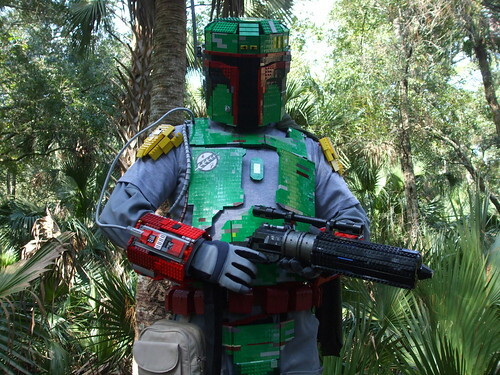 He was currently working on LEGO steam punk for this year’s DragonCon. I don’t know if you’ll need a Facebook account to view the video link… If you do, leave me feedback.